I had nothing major on my schedule this afternoon so I tagged along with my brother and Conor to watch Marvel's latest offering, The Guardians of The Galaxy. Conor has been chomping at the bit to see this movie for months now. He missed opening day because he was down in St. Bernard's with his grandparents and just returned last evening. Frankly, I was not too excited about seeing a movie about a bunch of comic misfits that included a tree and a raccoon. “Guardians of the Galaxy” is officially rated PG-13 for intense sequences of sci-fi violence and action, and for some language. There is something to be said about having fairly low expectations going into a movie. The movie was a spectacular visual and zany action packed extravaganza. Watching it in IMAX 3D made it that much more of an experience. None of the new characters overshawdows the other. Each gets lots of screen time and the movie fills in the back stories of each one. The new universe is beautiful with our new unlikely heroes having fun with a great soundtrack of tunes from the 1980's. It was as much of a comedy as anything else. Some of the humor was adult- the crudest of which had the theater in stitches, fortunately it went way over the kids heads. I love the space opera genre and this great movie reminded me what it was like to be a kid. I am now looking forward to re-watching some of my favorite classics from the genre with the boys like Battle Beyond the Stars, Serenity and Babylon Five. In fact I think my dad, a big fan of the Western genre would enjoy this movie, an updated Magnificent Seven! Conor went to bed tonight singing "Hooked on a Feeling" , in between babbling about comic books and making me promise to take him to Toys R Us tomorrow to look at Guardian Lego sets. 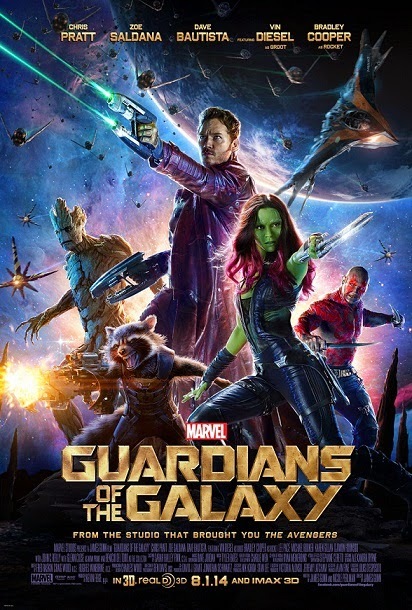 At the end of the day, “Guardians of the Galaxy” is great for teen and adult audiences. I can not wait for the sequel.